Rediff.com » Business » What 'Make In India' means to these Indians! What 'Make In India' means to these Indians! Amid the multi-billion dollar investment announcements and the flurry of MoUs, four artists give us glimpses into their lives. Call it the other side of 'Make In India,' if you want. Dilip Chavan, left, and Sunder Bhosale, right, are having a good time. They have a day job, so what if this is just a one-day job. 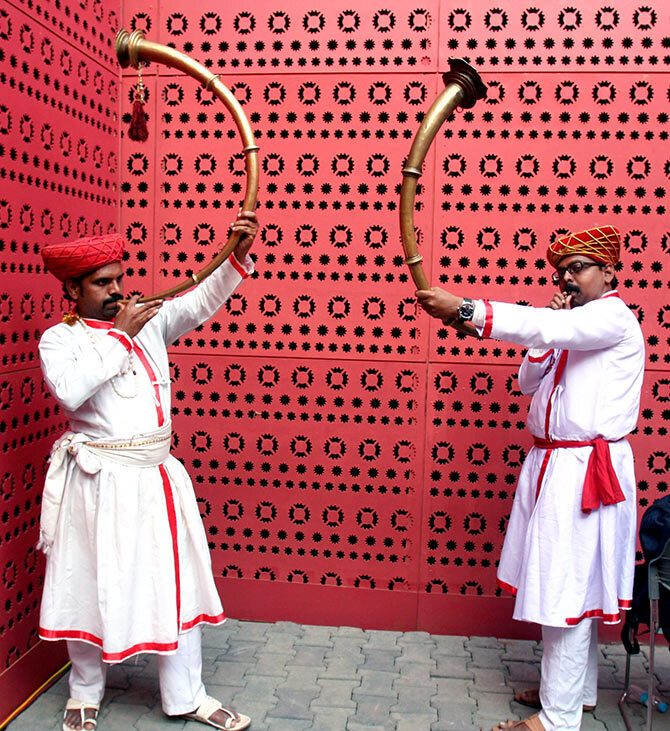 These two Mumbaikars, in their mid-30s, were hired to play the tutari (a traditional curved metallic, musical instrument made popular by Shivaji Maharaj and his mavlas) outside Hall 18 to herald the arrival of Shiv Sena President Uddhav Thackeray and Maharashtra Chief Minister Devendra Fadnavis. Chavan, a resident of Chembur, north-east Mumbai, hails from Ahmednagar district and has been playing the tutari since 2002. Music runs in his family. "My father used to play the shehnai," he says. Bhosale who stays in Dadar, in the heart of the city, said the tutari is "my bread and butter." While the billion of dollars will be invested in various businesses and probably have a 'trickle down effect' -- as and when it happens -- if you were to look at the brighter side, Dilip Chavan and Sunder Bhosale, both unemployed otherwise, had a day's fruitful work. The Marathi manoos went home to their families as happy men having earned Rs 500 each for a day's effort. Unlike Chavan and Bhosale, Khan is fortunate. He had full five days' work. And each day will make him richer by Rs 800. 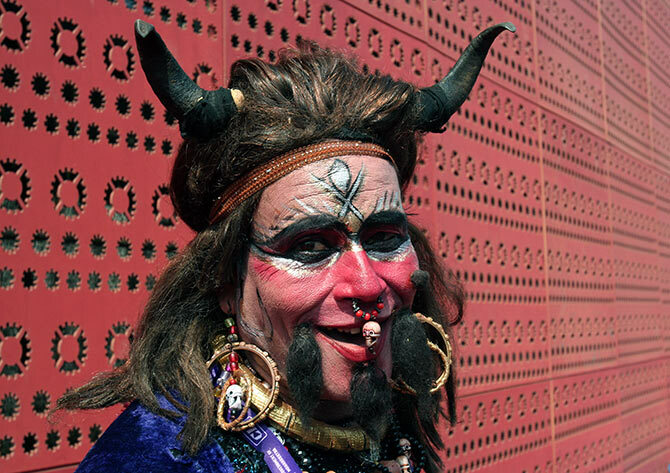 "But then I don't get such work every day," says Khan who is dressed as a djinn. "There are two types of djinns," he explains, "one that is made of fire and the other one is made of water." "I have to arrange for my own make-up. I pay that money," he adds and hoes "hahahahahahaha" devilishly to make his presence felt. Khan has it in him to easily attract an audience who emerge from various halls where the political and business leaderships of the country has just dealt in dollops of dollars. Janki Pradhan has come all the way from Odisha's Sambalpur district. 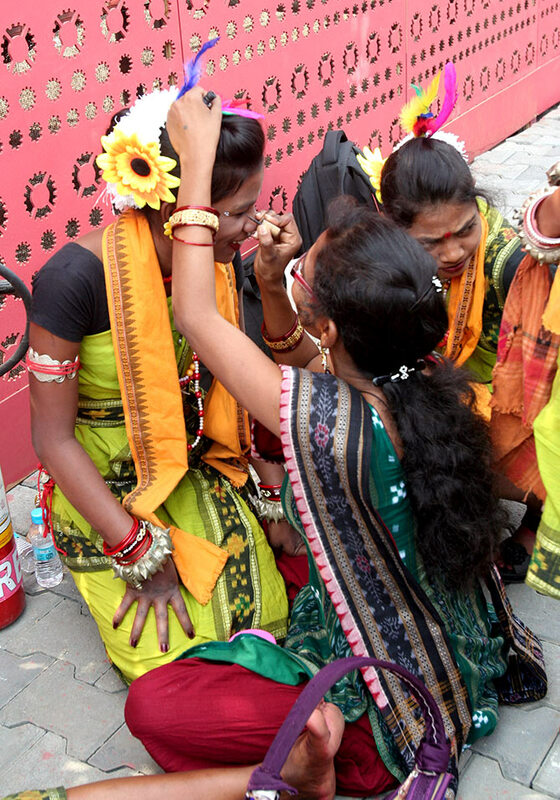 Part of a team that is made up of folk dancers and singers, she is busy getting made up for her next performance atop many of the stages that adorn the Make In India campus in Mumbai's Bandra-Kurla Complex. She points to her team leader Siva while shying away from interacting with people. Whoever asks her questions, she directs the person to Shiva. Pradhan, says Shiva, leads a hand-to-mouth existence. No place for Mumbai top cop @MakeInMumbai?